Felt has a very interesting history, and is the oldest textile fabric known to date. Relatively inexpensive today, felt has very rich roots. Used for a variety of reasons, felt dates as far back as fourth century B.C. Rugs have been commonly made with felt throughout history, and are still commonly made today. During Civil War times, rugs known as "penny rugs" were made from felt. 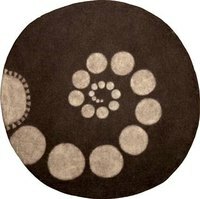 The penny name was a result of the circular shaped felt pieces adorning the rug. The penny rugs were more of show pieces than rugs; most were typically used for wall decorations. You can create your own felt rug, which can be used on the floor or the wall, with very little expense. It looks great and can be made in many sizes and colors. The felt can be purchased in six-foot widths and varying lengths, so it is possible to have many size choices when designing your rug. Cut your felt to the desired width and length for your rug. Decorate your rug with whatever patterns or designs you find most interesting. This can be done by cutting complimentary colors of felt into different shapes and patterns. Attach your designs by either sewing them on or using glue. For the non-sewer, glue works just great! Slice the edges of your rug to create a fringe. Your cuts should make fringe pieces that are two inches long and one-half inch wide. Tie off your fringes in pairs, creating knots. This offers a neat effect to your rug design. Lay your rug on the floor, over a no-slip pad. Voila! You have a beautiful felt rug that you made yourself!